Estrogens in treated wastewater that find their way into temporary wetlands known as vernal pools persist for weeks or even months, according to researchers, who suggest that persistence may have implications for these critical aquatic habitats. An eight-week study of estrogens' behavior in three vernal pools in the area of Penn State's Living Filter, produced these findings that provide insight into current treatment inadequacy and water reuse generally. The Living Filter is a 600-acre tract where Penn State has been spray-irrigating all its wastewater on crop fields and forest since the 1980s. This 2015 spring study intentionally coincided with the development period of native amphibian larvae, deemed an "ecologically relevant" interval by researchers, as estrogens have the potential to cause endocrine disruption in amphibians. In addition to gauging the presence and concentration of estrogens in both the treated, sprayed wastewater and pool water, researchers installed sensors in each pool and measured various physical and chemical parameters, which included dissolved oxygen, oxidation-reduction potential, water level, water temperature, electrical conductivity, pH, and rainfall throughout the study period. In the highly oxygenated water of streams and rivers, estrogens break down relatively quickly. 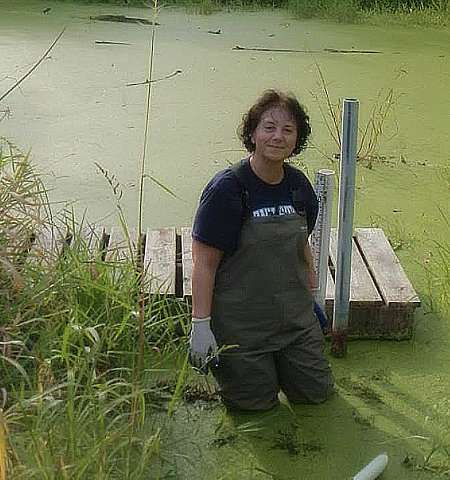 But this study demonstrated, for the first time, that in the dissolved-oxygen-depleted water of vernal pools the estrogens persist and even transform into parent compounds, explained lead researcher Odette Mina, a doctoral degree student in the College of Agricultural Sciences when the study was conducted. "I selected those pools specifically due to their close proximity to the spray-irrigation laterals, allowing for direct input of the treated wastewater into the pool water," said Mina, now managing director of Penn State's Energy and Environmental Sustainability Laboratories. "Conditions of the ponds are very different from streams. They hold standing water in which duckweed is growing, so the physical and chemical parameters affect the persistence, transformation and degradation of the estrogens." 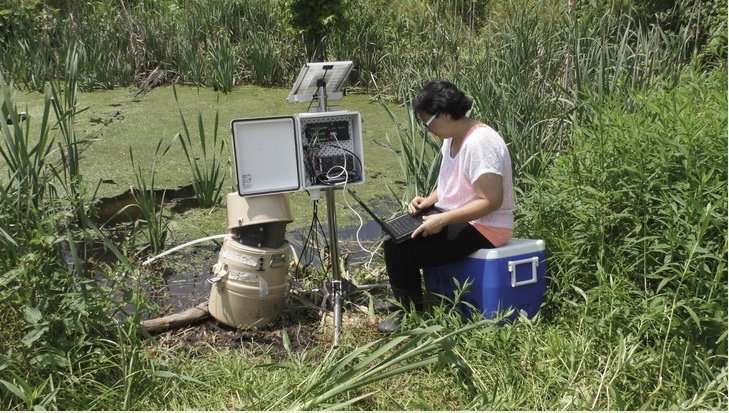 Because researchers sampled the treated wastewater effluent during each weekly spray-irrigation event, as well as the water in the vernal pools, they detected some notable differences, showing transformations in the pools. Estrone—an estrogen naturally excreted by people—was present in nearly 100 percent of the vernal pool samples, with relatively high concentrations. The researchers also analyzed the vernal pool water for other naturally excreted estrogens, including 17 alpha-estradiol, 17 beta-estradiol, and estriol, as well as estrogen, 17 alpha-ethinylestradiol—a synthetic estrogen widely used in birth control pills. The synthetic estrogen was detected in fewer than 10 percent of the vernal pool samples. "When estrogens are introduced into these anoxic (oxygen depleted) pools, they tend to transform back and forth between parent compounds and metabolites and don't degrade like they would in aerobic (oxygen rich) conditions," Mina said. "The presence of natural estrogens in the vernal pools that were not detected in the spray irrigation effluent suggests transformation of estrone, a metabolite, back to its parent compounds, 17 alpha-estradiol and 17 beta-estradiol." This transformation has never been documented before in vernal pools, and since the parent compounds are generally more potent than their metabolites, these findings have important ecological implications. "The synthetic estrogen, 17 alpha-ethinylestradiol, was detected in only the first round of irrigation," Mina said. "That was a time when students were still on campus, and because the younger population is taking contraceptives, it ends up in the wastewater. The students were home for the summer in the later irrigation rounds." The findings of the research, which was published this month in Agriculture, Ecosystems and Environment, are significant, according to Heather Gall, assistant professor of agricultural and biological engineering, whose research group led the study. She noted that the planned, beneficial re-use of water has become an increasingly common conservation practice worldwide, sparking questions about the degree of water treatment needed to mitigate negative environmental impacts. Sewage treatment plants are not designed with the capability to remove hormones or other emerging contaminants, and there are currently no water standards for these contaminants. Low concentrations of pharmaceuticals, personal hygiene products and pesticides in waters—just to name a few—are known to be causing reproductive abnormalities in fish and other aquatic organisms. When wastewater is reused for irrigation activities, some environmental tradeoffs are likely occurring. "This was the first study that looked at the persistence of estrogens in vernal pools, but we know from other research that aquatic life can be impacted by extremely low concentrations of estrogens and other emerging contaminants," Gall said. "This research focused on Penn State's Living Filter, but vernal pools around the country are being affected by runoff from malfunctioning septic systems and other domestic and agricultural sources of emerging contaminants." Gall's research group is planning follow-up studies this spring to evaluate whether pharmaceuticals and other endocrine-disrupting compounds are found in these sensitive habitats.